Arlington Public Library What to Read: Nevermore. On this date in 1845, Edgar Allan Poe's classic poem, "The Raven", was first published in the New York Evening Mirror. It became an instant sensation, being re-printed no fewer than 16 times in various venues that year. 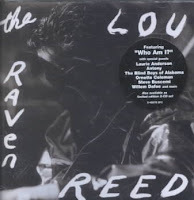 It continues to be revisited and reinterpreted by modern artists, as in Lou Reed's 2003 CD "The Raven". The album is Reed's tribute to Poe's work, featuring rollicking songs inspired by his stories and poems along with a few direct recitations of a few key pieces. The titular version of "The Raven" is primarially a spoken-word piece fervently delivered by Willem Defoe, with a spare string arrangement filling out the corners of the track. Defoe is only one of Reed's all-star collaborators on the project, along with Ornette Coleman, Steve Buscemi, The Bind Boys of Alabama, Laurie Anderson and many others. So, happy 164th birthday, Raven. May you continue creeping us out and inspiring us in equal measure for evermore. Love Lou Reed! Can't believe I haven't heard this one, but I'll definitely check it out! When I was little, my dad would recite poetry to me and my brother. His favorite poem to recite was "The Raven" (followed by "Stopping By Woods on a Snowy Evening", and "Paul Revere's Ride", and portions of "Rime of the Ancient Mariner"). Fans of Poe should also check out The Edgar Allan Poe Audio Collection, which is read by Vincent Price an Basil Rathbone. I love The Blind Boys of Alabama, so I can't wait to hear this one.